This hand hammered design brings the flair of traditional Latin American crafting to your ensemble. Argentinian jewelry designer Fernanda Sibilia brings the flair of traditional Latin American handicraft to her rustic, hand-hammered metal pieces. 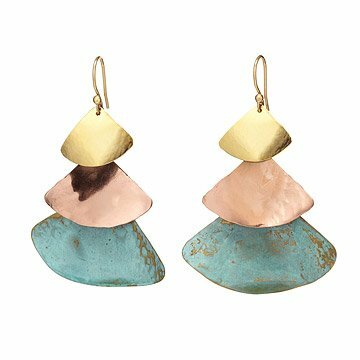 To make these autumnal earrings, she deftly shapes brass sheets into delicate petals and electroplates select elements with lustrous gold and warm copper. She then lets the magic of oxidation give select pieces a one-of-a-kind patina that varies in hue from dark umber to creamy sea green. To finish, she strings a trio of the fluttery, triangular pieces onto chic gold-plated earring wires. Handcrafted in Buenos Aires, Argentina. Please avoid direct contact with water (salt or fresh), excessive perspiration, and chemicals such as chlorine, sulfur, perfume, detergent, chemical agents, cosmetics or oxidizing cleaning products such as dishwashing liquids. Excessive light, heat or moisture will deteriorate the quality of the plating on the metal. The metal may darken or tarnish with normal wear. After each use, gently wipe with a soft cloth and store in a jewelry box or in a fabric pouch. Do not wipe the metal surface with a polishing cloth because excessive polishing may rub off the plating and is not recommended.